If the Goonies grew up to splinter into two mortal enemy factions, it would be a lot like what happens to the Five Fingers. They were inseparable during their Apartheid-era childhood, but as adults, their interests and values diverged drastically. 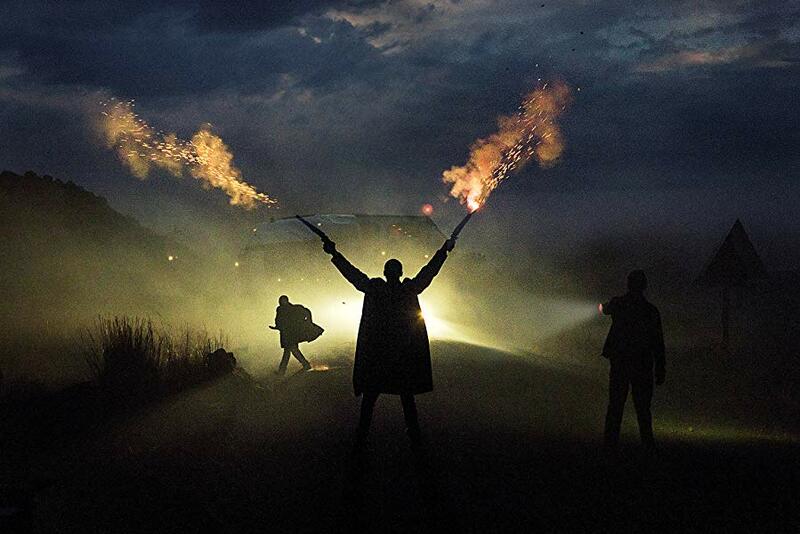 It is all Tau’s fault, but he has finally come home to find some redemption in Michael Matthews’ Five Fingers for Marseilles (trailer here), which opens this Friday in New York. The five lads used to have fun playing cowboys, but their innocence ended when two crooked tax-collecting cops abducted their friend Lerato. The hot-headed Tau saved her, but in the process, he killed two officers. For years, he lived on the run as a modern-day highwayman, praying on desperately poor travelers who can least afford it. After a prison stint, Tau resolves to live a quiet life, if not necessarily a straight one. He returns to Marseilles (the other one), finding it changed, yet still the same. Pockets, the well-heeled former Finger is now the Mayor and Cockroach is his brazenly corrupt chief of police. Although Pockets talks a progressive game, it is clear he and Cockroach have just picked up where the former government left off. Unathi, the storyteller of the Fingers is now a priest, but watching his former friends abuse their power has precipitated more crises of faith for him than what Ethan Hawke experiences in First Reformed. Maybe “Zulu” is the lucky one. He is not alive to witness the Fingers’ fall from grace, but his dead-ringer son sees it all. Yet, as bad as Pockets and Cockroach might be, there is a new gangster in town who is even worse. His archetypal name is “Ghost” and he can immediately tell Tau will be bad for business. At just a whisker under two hours, Marseilles runs long by any western/revisionist western/eastern western standard, but it still provides several major characters only the scantest personality development. However, it certainly gives western conventions a few clever twists, including Tau’s ad-hoc reformation of the Five Fingers. In fact, some of the most interesting characters are those unlikely allies, particularly “Honest John,” the drunken traveling salesman and Wei, the Chinese immigrant shopkeeper Cockroach mercilessly extorts. Dean Fourie is so fabulously flamboyant and debauched as Honest John, we’d humbly suggest his own spin-off vehicle. Kenneth Fok is much more tightly restrained as Wei, but he really gives the film some heart and soul. Vuyo Dabula has the right kind of imposing physical presence for Tau, but he only has one performance setting: remorseful brooding. As Pockets, Kenneth Nkosi seems to ooze greed and hypocrisy from every sweaty pore. Unfortunately, Hamilton Dhlamini does not make much impact as Ghost, despite his considerable physical size. Cinematographer Shaun Lee is definitely on-board giving the Eastern Cape landscape the Monument Valley treatment. Granted, a tighter editorial hand would not have hurt the film, especially during their early slingshot-wielding years, but isn’t that always the case? However, you have to give Matthews and screenwriter Sean Drummond credit for their meet-the-new-boss-not-nearly-different-enough-from-the-old-boss honesty. 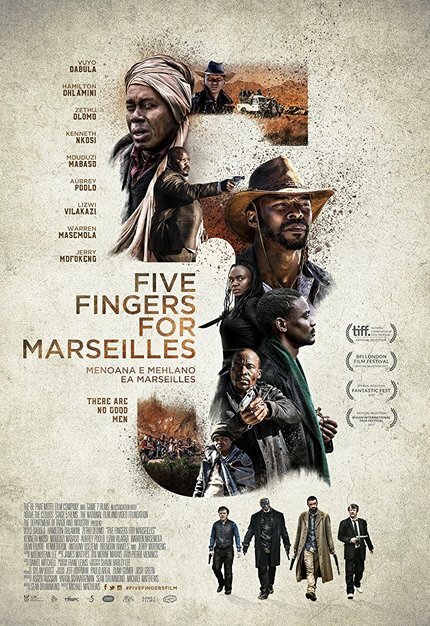 Recommended as a sweepingly tragic South African take on the Western genre, a “Bobotie Western,” Five Fingers for Marseilles opens this Friday (9/7) in New York, at the Cinema Village.